The change in personnel at the Federal Reserve has help sustain a miniature bond bear market that started in the third quarter of 2017. Although I do not offer investment advice, I think it is clear that nominal bond yields are better placed relative to Fed officials' desire to raise the policy rate. The key question is what level they will begin to pause. If mainstream theory were correct, there would be some way of estimating the natural rate of interest reliably, and we could then have a better idea of when the policy rate is at an appropriate level, and we could thus expect a pause. Unfortunately, the natural rate of interest appears to be a will-o'-the-wisp. Otherwise, the reliable way to end modern rate hike cycles is for some segment of the financial sector to blow itself up, ending some ill-advised investment boom. However, the ugly reality is that fixed investment (and hiring) has been tepid this cycle, and so it is unclear that there is an significant mania that can blow itself up. Sure, there are pockets of exuberance, such as the crypto-currency mining mania. However, it is unclear whether any mishaps in these areas of malinvestment will be enough to trigger a global downturn. From a directional perspective, the market action in U.S. inflation-linked bonds (TIPS) was downright stereotypical. 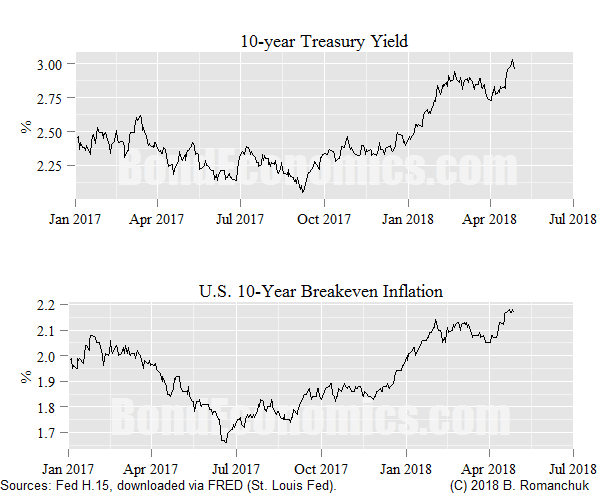 As the chart above shows, the 10-year breakeven inflation rate (the 10-year nominal yield less the quoted yield on the 10-year TIPS -- link to primer) followed the pattern of the nominal 10-year yield almost perfectly in 2018. That is, the breakeven inflation rate rose, but by a smaller amount. This is a classic episode of directionality, which I have argued is more closely associated with bear markets (and not largely directionless range trading). I discussed directionality in this article in January, as well as in Interest Rate Cycles; the former article is being incorporated into my upcoming book on breakeven inflation analysis. If you had asked me to structure a bear market trade, a rise in breakevens would have been the bread and butter answer. However, things are starting to get awkward. Breakeven inflation is no longer cheap relative to where the Fed wants inflation to be (and inflation has averaged below where they wanted it for a considerable time). If one is bullish on oil, there is perhaps more room for headline inflation to rise. Otherwise, it will be hard for breakevens to follow the rise in nominal yields (even with a beta of less than one). I think trade structures would need to get somewhat fancier, taking into account the shape of the breakeven curve. My name is Anuj Agarwal. I'm the Founder of Feedspot. I would like to personally congratulate you as your blog Bond Economics has been selected by our panelist as one of the Top 25 Bond Market blogs on the web. I personally give you a high-five and want to thank you for your contribution to this world. This is the most comprehensive list of Top 25 Bond Market blogs on the internet and I’m honored to have you as part of this! We'd be grateful if you can help us spread the word by briefly mentioning about the Top 25 Bond Market blogs list in any of your upcoming post.